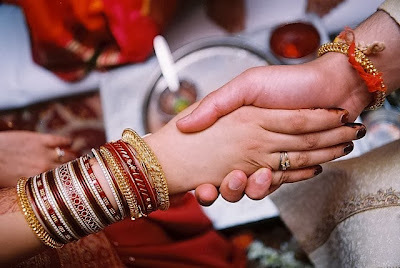 This post will provide you quick tips and tricks to get married, astrological remedies for early marriage.This are astro uncle ke asan upay jaldi shadi ke upay. Apnaiye or fark 1 mahine main fark dekhiye. Agar Kisi Ladki ki Shaadi der se ho rahi ho to use naye kapde pehnaye, jab ladka dekhne aaye. Wearing new clothes when the marriage talks begins. If the marriage talks are getting break after reaching the fina stage then Make a point and whenever marriage talks start, put the shoes or slippers on that point only. the talks will finalize very soon. Whenever Girl enters to the boy's house, girl's parents and other parents should put either left or right foot in the house with the thought in the mind that nostril from which they are breathing. Whenever a boy comes for marriage talks, girl should open her hairs, not to tie them and keep happy and always offer sweets to them. Whenever you go to any marriage, the boy and girl should put bit of mehandi meant for bride or groom, whenever you get chance. To get married early, girls should do 16 Mondays of consecutive fast and pray to lord shiva at temple. dress like goddess parvati, tie the knot between Shiva and Parvati and pray for early marriage. You can Offer Red chunni, red bangles and sindur things related to marriage in the temple, to Lord Shiva and Parvati. Get an Old Lock without keys that you have using in your home and rotate it around your head 7 times and throw it at any crossing, and do not look back towards the lock. Mix a pinch of Haldi (Turmeric) in the water and take bath with it whenever possible. Own or Keep Rabbits in your home and feed them with your own hands daily. Girl should worship Shiva-Parvati and keep use this mantra daily, ऊँ नमः मनोभिलाषितं वरं देहि वरं ही ऊँ गोरा पार्वती देव्यै नमः”।["OM NAMOH MANOBHILASHIT VAR DEHI VAR DEHI OM GODA PARVATI DAITYA NAMAH"]. If the boy and girl reads the verses related to the marriage of Shiva and Parvati in the Balkand of Ramcharit Manas everyday, their wish to get married will be fulfilled very soon. Shaadi ke umar wale ladke ladki, pour sacred water over shivaling and place 108 flowers over it, chanting the mantra Om Namah Shivaya and praying for early marriage, on Fridays. Also offer 21 Belpatras to Lord Shiva. Do it for 7 consecutive Fridays. On Thursdays, offer Kalangi ( Which is there at the top of the ‘Sehra’) in Vishnu Laxmi temple, along with 5 laddoos. If the Son is not getting married, unexpected obstructions creating problems, do the Dutga Saptashati Mantra with samput. ["Patni manorama dehi manovrutanusariniy, tarani gursansar sagarsy kulodrnam"]. Also, you can use Shaadi.com and jeevansathi.com like materomonial sites to get married through internet. create your profile and get married via internet.